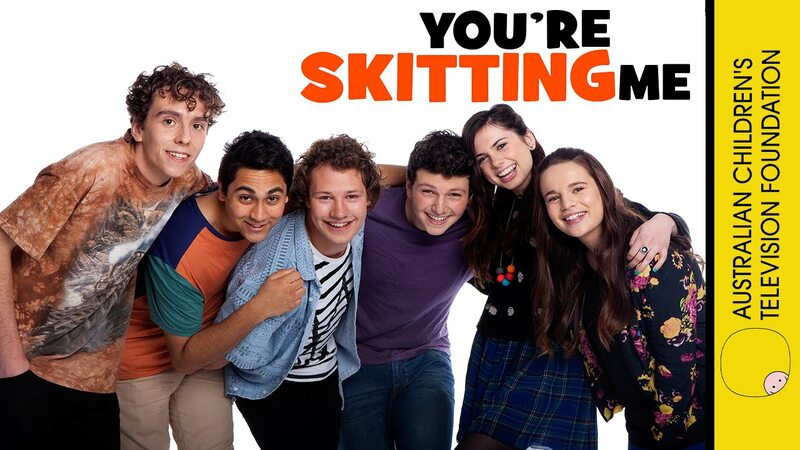 You're Skitting Me is an edgy sketch comedy, starring all new Australian talent and featuring a random mix of characters, parodies and animations. The sketches are an edgy mix of zombies, cavemen, scary Girl Guides, parodies of Twilight and talent shows as well as some offbeat animations, that will delight kids and parents alike. Made for ABC3 by Jigsaw Entertainment, the show stars an ensemble cast of six teenagers, five of which are new to television audiences. You're Skitting Me - Series 2 is the latest in sketch comedy for kids. The sketches are an edgy mix of zombies, superheros, scary Girl Guides, Romans, parodies of Dr Who, Masterchef and Gollum as well as some offbeat animations featuring Vomit Boy and a new twist on fairy tales. The show stars an ensemble of six teenagers cast for their comic skills. Cosmo, Jake, Hayden, Mia, Molly and Rowan are fresh, funny, unpredictable and different. YSM was made with high production values, is tightly formatted and fast paced. It has the familiarity of format that will appeal to young viewers, but a sophistication of material that can be enjoyed by everyone. Warning: the ROFL effect watching YSM has serious consequences. A digital sketch comedy writing tool inspired by the You're Skitting Me TV series. Motivating and engaging your students in the productive modes of speaking, writing and creating has never been so entertaining! Developed specifically for kids aged 9-14, the Sketch-O-Matic is a web-based project tool that introduces students to the comedy genre and with advice from the pros, guides them through the process of writing their very own comedy sketch. What is comedy? Where do I get an idea? How do I know if my sketch is funny? You’re Skitting Me video clips – contemporary, Australian examples from which students can learn to identify the different types of comedy and on which they can model their own work. A digital scrapbook - in which students can record and generate their own ideas. A online scripting tool - in which students can write their own comedy script, adding characters and direction for printing and testing with an audience. Raw behind the scenes footage - of the TV series writers, cast and crew offering their own 'tips and tricks' for successfully creating comedy that entertains and engages an audience. What is comedy? Stage 1 provides a concise definition of comedy and how comedy is created and used. Stage 2 outlines the different types of sketch comedy, using video examples from You’re Skitting Me to demonstrate the nuances of each type. Comedy comes from chaos! In Stage 3, students are encouraged to use their own experiences, observations and interactions as inspiration for their comedic ideas - and write them down, using their digital scrapbook. Now, write! Stage 4 presents an online scriptwriting tool in which students can take an idea and develop it into an organised text by adding characters, dialogue and directions. Students are emailed a project certificate for their achievement of completing the 5 Stage process.